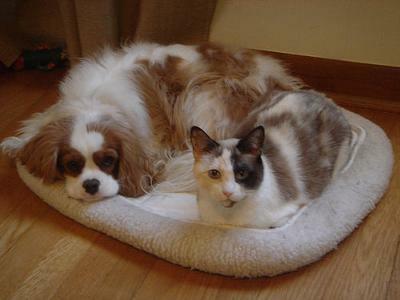 Dog and cat are safe together when it comes to FIP - photo by pt (Flickr) - added by Michael - they are not connected to this story. This story begins with a question. Not a rhetorical want. I would love some answers anytime soon. My puppy has just eaten my cats poo. The problem is, my cat is dying from FIP. I don't know what do, can you help me? Can my dog catch this? Hi Jane... thanks for visiting and asking. I am not a veterinarian. 1. Can this disease cross from cat to dog? 2. If it can, can it be transmitted through cat faeces? The Coronavirus (FCoV) causes FIP (Feline Infectious Peritonitis). FCoV is shed in the feces and to a lesser degree in the saliva of infected cats1. The virus cannot cross species so it cannot infect your dog. A dog sharing a house with an infected cat cannot catch FIP. The disease is not zoonotic either. This means that we cannot be infected by the virus3. 1.1. Addie DD, Jarrett, O: Use of a reverse-transcriptase polymerase chain reaction for monitoring the shedding of feline coronavirus by healthy cats. Vet Rec 148: 649-653, 2001. Hi Joyce. I think I will research that one. It seems strange for a dog to eat poo anyway. Why do that if they are fed well? Mar 31, 2010 Hi Jane! Please stay with us. You can look up anything you need to know about cats right here on the home page. I've been a daily member since November and even write about my cats. As for the poo issue I deal with it myself. I have a time keeping my dogs out of the litter box. The same thing happened years ago when I had several cats so it came as no surprise. My biggest question on this issue is why do the dogs turn their noses up to some dog food yet act like the litter box is a "delicacy bar."